Aren't these diaper covers adorable? The pattern I used is actually intended for a boy diaper soaker, but I have girls. More importantly, my baby is a girl. So, I made these in pink and purple. They are incredibly soft and make her baby bum look so cute! Don't you just love the pockets on the back? I LOVE THEM! They look so adorable on. Here they are in pink. 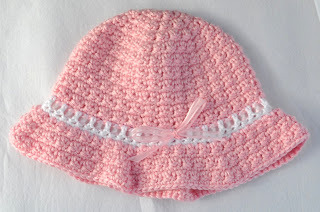 I created a hat using this texture to match these diaper covers. I'm currently working on a bib and will be making a burp cloth as well. Leave some love! I'd love to hear your comments!